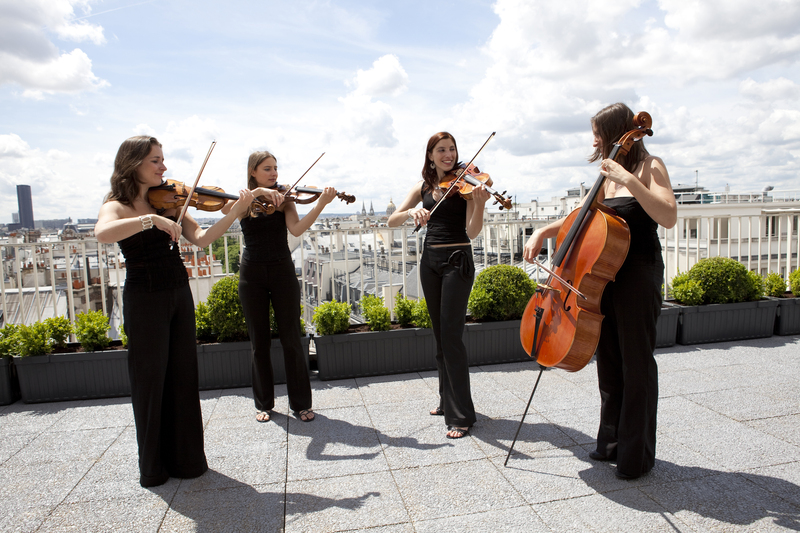 The string quartet is composed of four young women whose shared passion for chamber music results in an extensive repertoire and experience providing live music for all kinds of events, ranging from weddings, parties and corporate functions to recording sessions and TV shows. 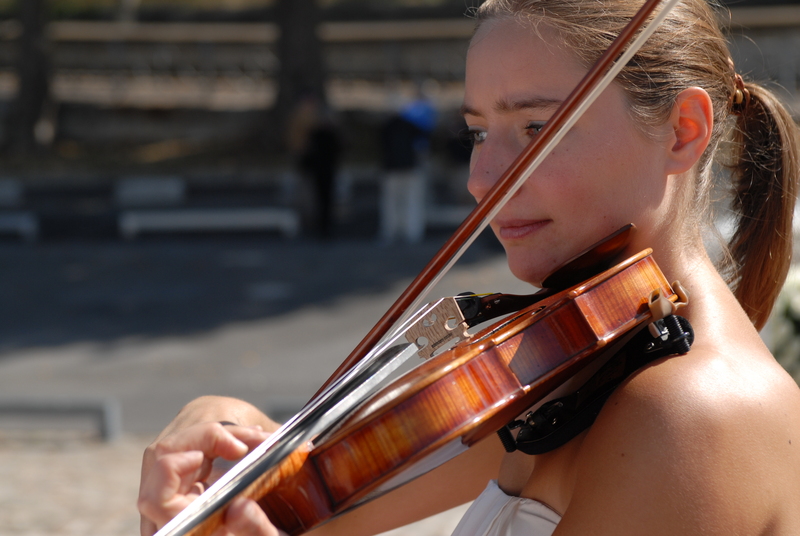 They will work with you to establish the repertoire that suits you best. 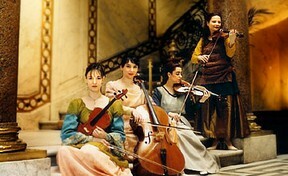 Baroque Music such as the four seasons by Vivaldi, Pachelbel’s Canon, Watermusic by Haendel, J.S. 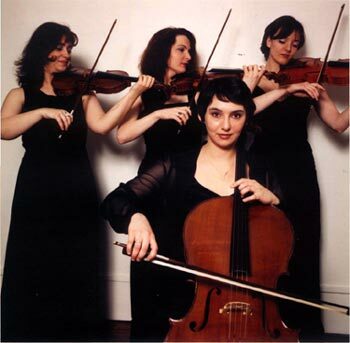 Bach’ s Aria, Brandebourgeois concertos, or concerto for two violins. 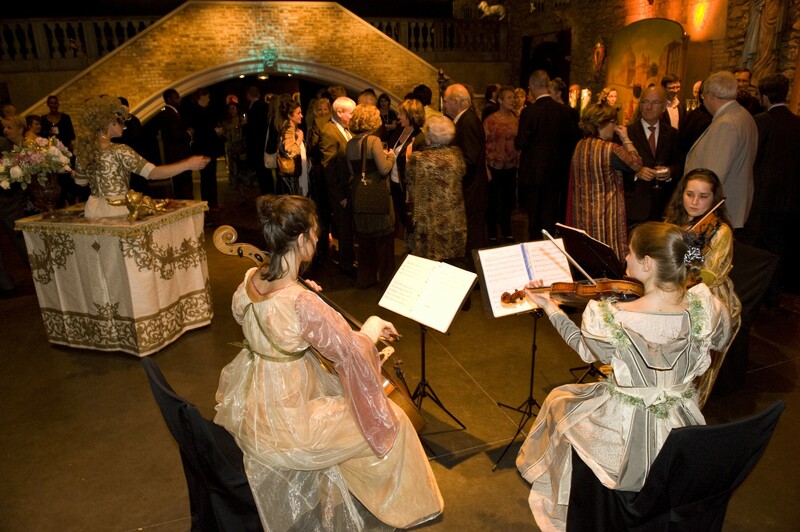 Classical Period such as Mozart’s divertimento, Little Night Music by W.A.Mozart, Figaro’s wedding by W. A. Mozart, Airs by Haydn. 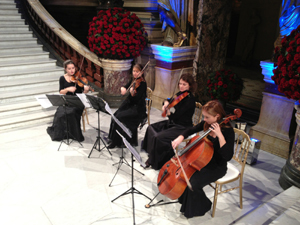 Romantic Music such as rêverie by Schumann, musical moment by Schubert, Dvorak’s waltzes, Beethoven’s pieces. 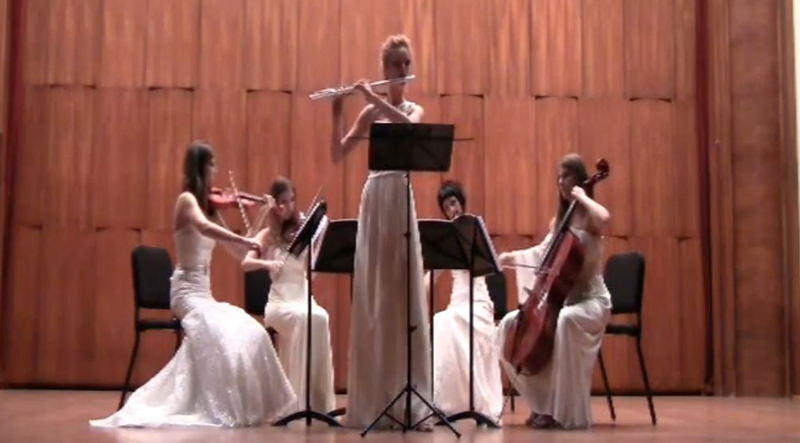 Waltz such as The Blue Danube by J. Strauss, The « Sleeping Beauty » Waltz by Tchaikovsky, Waltz of the Flowers, Tchaikovsky. Pieces of French music such as Carmen by Bizet, Fauré’s Pavane, The Girl with flaxen hair by Debussy, Panis Angelicus by Franck, Boléro by Ravel. Jazz and Broadway Musical : West Side Story, Cats from Memory, standards by G. Gershwin, Georgia Brown, Caravan, Bluesette, Lullaby of Birdland, Summertime, Take Five, Sir Duke, Embraceable you, Unforgettable (Cole). Pop : Beatles, Abba, Elton John, Michael Jackson, Coldplay. Film’s soundtrack : Breakfast at Thiffany, Moon River, Diva, Titanic, Manhattan de Woody Allen, Rhapsody in Blue by G Gershwin, Victor Victoria, Crazy World. 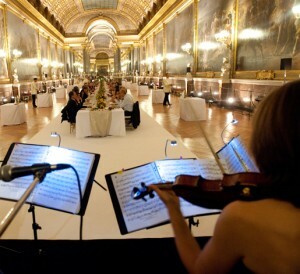 International Music : Franck Sinatra, Charles Trenet, Edith Piaf, Michel Legrand, James Brown, Stevie Wonder, Jason Mraz. Tangos : Scent of woman de Gardel, Chau Paris de Piazzolla, Tomo Obligado de Gardel, El Choclo, Jalousie de Gade, Tango de Roxane d’Usher ( film moulin rouge), Preparense de Piazolla, El Dia que me quieras cuerdo de Gardel. 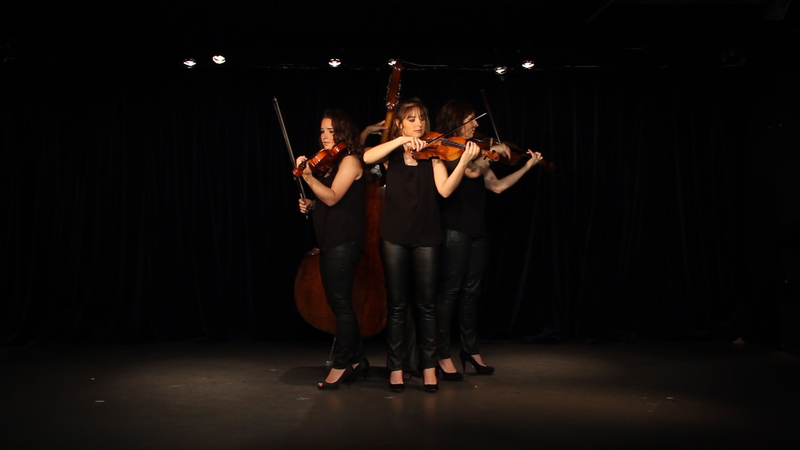 Here you can watch pop music videos of the string quartet. 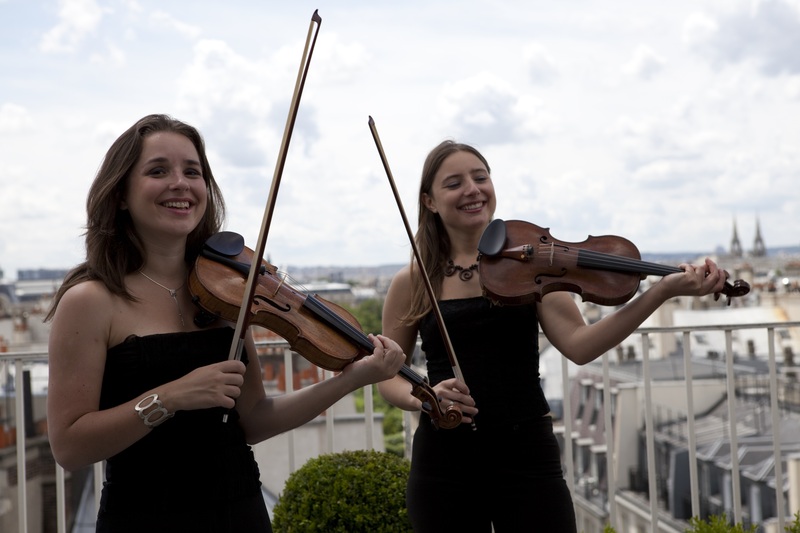 french music string quartet, french string quartet, Paris string quartet, string quartet classic music, string quartet events, string quartet Paris, string quartet pop music, string quartet romantic music. Signet. My fiancé and I are getting married at Chateau de la Couronne in Marthon, France on 27 August 2017. 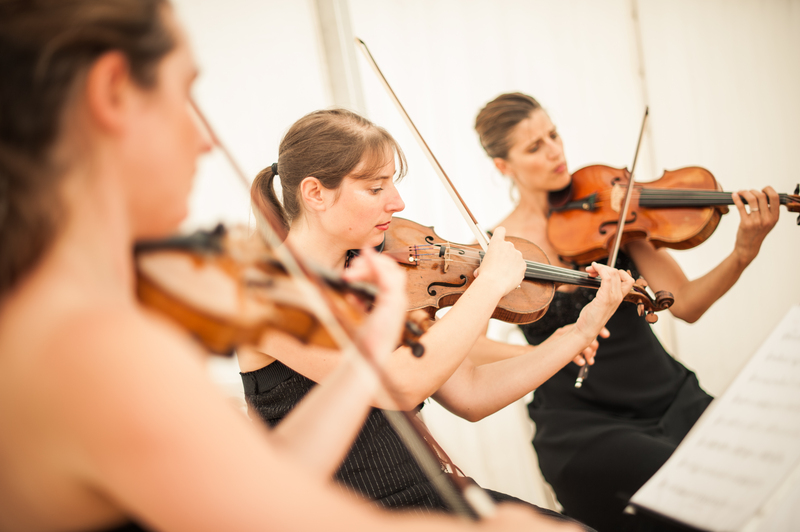 We are having a church ceremony in the village church (a 5 minute walk from the chateau) and are looking for a string quartet to play during the ceremony (the ceremony itself shouldn’t last longer than one hour). 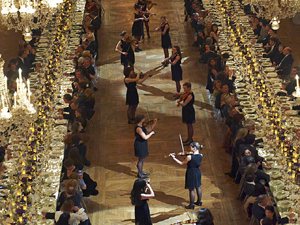 We would like the quartet to play Pachabel’s Cannon when I walk down the aisle, all of the hymns (haven’t decided which hymns yet but there will probably be around 3 hymns) and Mendelssohn’s Wedding March as the exit music. 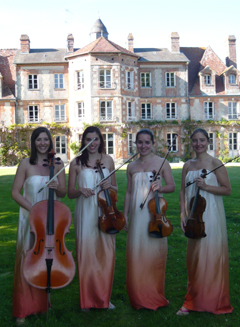 We would also like the quartet to play for an hour at the champagne reception at the chateau which will immediately follow the church ceremony. I’d be grateful if you could confirm your availability for 27 August 2017 and send me a fee quote for the above. Répondre à Lauren Julien Annuler la réponse.